Clearly, being online and connected is the key for receiving information, sharing news, and organizing protests. I watched the BBC program “How Facebook Changed the World: The Arab Spring” about the importance of social media in the changes happening in Egypt and other countries. (If you have couple minutes, search for it on YouTube). Clearly, being online and connected was the key for receiving information, sharing news, and organizing protests. 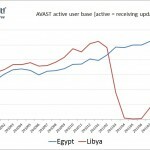 I looked at our user base statistics for two neighboring countries, Egypt and Libya, as it shows very different picture of how people in those two countries were actually able to get online in the first place. The attached chart shows our ACTIVE user base where ‘active’ means avast! Free Antivirus installations that received a virus-definitions update during the previous 30 days (rolling). This means that when the computer is turned off or not connected to internet, it does not receive an update from our servers and we are not counting it as active. In both countries, our active user base grew by over 50% during January and February 2011. In Egypt, despite the increasing protests, the availability of online connections grew throughout the spring and it seems that more and more people were able get online and even install new computers. By summer, we had over 1 million active installations in Egypt. However in Libya, the development took a completely different turn. In March the internet connection was cut and basically unavailable for the entire country until July. The active avast! user count plummeted, dropping basically all the way to zero before growing again in August when the NTC fighters took over Tripoli.